I was trying to remember how many times I've made this bread in the last couple of months. I think the first time was in the beginning of October. To Read More, Click On The recipe Title. My husband loved this so much he asked me to make it for his birthday, which is the end of October. I've made it two more times since then. I've never blogged about it because it never stuck around long enough for me to get pictures. I made a point of doing that today. Everyone that's tasted it has absolutely loved it, hands down this is one fantastic quick bread. You'll notice that the recipe for the bread doesn't include any fat in the form of butter or shortening. The bread derives it's moistness from sour cream. The top of the bread is bathed in praline and ....well it's praline ,nuff said. The bread looked amazing straight out of the oven without the praline on top. With the praline, it's magical and will disappear before your eyes. 1. Preheat oven to 350°. Bake 1/2 cup pecans in a single layer in a shallow pan 6 to 8 minutes or until toasted and fragrant, stirring after 4 minutes. 2. Beat sour cream and next 3 ingredients at low speed with an electric mixer 2 minutes or until blended. 3. Stir together flour and next 3 ingredients. Add to sour cream mixture, beating just until blended. Stir in apples and 1/2 cup toasted pecans. Spoon batter into a greased and floured 9- x 5-inch loaf pan. Sprinkle with remaining 1 cup chopped pecans; lightly press pecans into batter. 4. Bake at 350° for 1 hour to 1 hour and 5 minutes or until a wooden pick inserted into center comes out clean, shielding with aluminum foil after 50 minutes to prevent excessive browning. Cool in pan on a wire rack 10 minutes; remove from pan to wire rack. Pretty darned impressive - I've already put a star on this one and I just happen to have all the ingredients at home - WOOT!!!! Wow, that looks divine and sounds so good! Need to make that! It looks so tempting and I'm sure was delicious! I'm a sucker for nuts and caramel! the topping really seals the deal with this one, bunny--sensational! My hubs loves praline and cream ice cream. I'm sure he'd be over the moon for this cake. That looks insanely delicious Bunny! 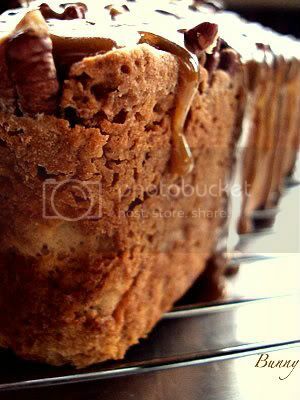 The pralines over top make it totally irresistible! It is easy to see why this bread would be such a success. It sounds like the perfect combination to me. It's ten degrees out. This would warm me up in the most delicious way. Looks so delicious. I love these types of breads and they never last long in my house either! Bunny, your Praline Apple bread does look magical! I know this would disappear in a jif at my house too. WOW - this apple bread looks sinfully delicious and almost just almost to good to eat. 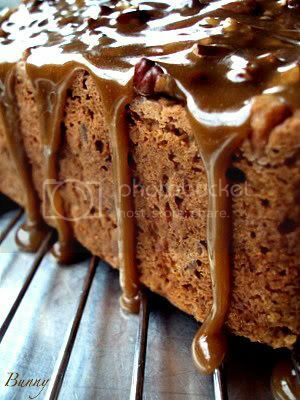 This praline apple bread looks heavenly! I'm going to make it this weekend when my family comes over to visit. Especially the great grand children. I bet they will freak out for it. Thanks for this recipe. I really appreciate it.